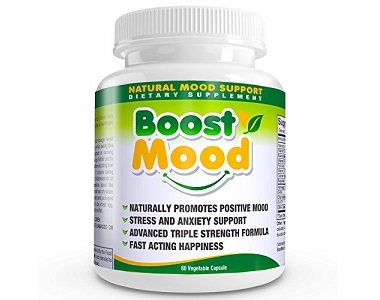 In today’s review, we examine a natural vegetarian friendly supplement called BoostMood. 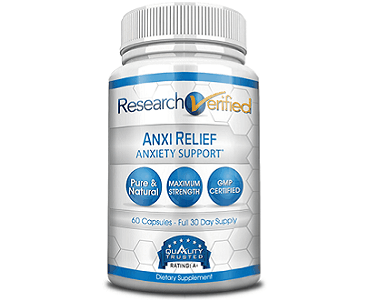 This mood enhancement supplement has as its stated benefits being able to help you a state of more even calm, versus up-and-down, erratic behavior. It also aims to boost your energy levels and concentration. These capsules are intended essentially formulated to be anti-anxiety agents, and to alleviate low to moderate levels of angst and depression. 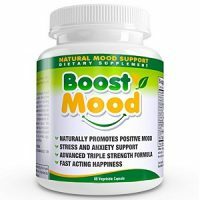 Boost Mood is amino acid- and herb-based. Importantly, BoostMood is intended to regulate the niacin-serotonin hormone levels in the brain. Balanced serotonin levels in the brain are critical to feelings of well-being, and also to getting enough quality sleep. Vitamin B3 or niacin helps elevate your mood. It also lowers cholesterol, improves brain functioning and increases energy levels. Serotonin is an important neurotransmitter. Tryptophan, an amino acid, is used to produce serotonin. Low levels of serotonin can cause depression and angst. This is why this product places such an emphasis on creating a balance of these two hormones. When that balance is better achieved, you should feel strong, less irritable, focused and remain healthier due to increased immunity levels. The capsules are also formulated to help you build up resilience to the kind of unforseen, rollercoaster situations life presents us with so often. Anxiety causes feelings of isolation. It also causes disproportionately intense fear of or avoidance of situations, emotional sensitivity and fatigue, to name a few symptoms. BoostMood asserts that its formula tackles angst and melancholy and their related symptoms. Ashwagandha – A plant commonly known as Indian Ginseng that improves wellbeing and decreases stress. DMAE Bitartrate – A nootropic that supercharges brain functioning. 5-hydroxytryptophan (5-HTP) – This is produced from the seeds of an African plant and helps with depression, insomnia, tension and many other ailments. GABA – A neurotransmitter brings down levels of angst and fixes interrupted sleep patterns by calming nerves. Vitamin B12 – Keeps both brain and immune system functions at optimal levels. Calcium – Assists to keep muscles healthy so they don’t go into spasm as a result of stress. Chamomile Extract (blossom) – A natural calming agent; it also helps fight insomnia. Folic Acid – Important to keep the brain, cells and tissue healthy. Vitamin B2 – An important antioxidant that boosts energy levels. Vitamin B1 – Also known as Thiamine, it helps to maintain proper nerve functioning. We are impressed with the inclusion of a nootropic, which is missing from many formulas. Do note though that high amounts of, or sensitivity to, DMAE Bitartrate can cause sleeplessness. However, the product contains no probiotics which we think are essential, given the clear scientific links between the nervous system in the digestive tract and the one in the brain. Lemon balm is another destressor which could possible have been included. How do You Use Boost Mood? Take 2 capsules daily with water, 30 minutes prior to meals. If you are nursing or pregnant, get the medical go-ahead to take this first. The same is true if you are on other medication. A 60-capsule bottle costs $39.99 on Amazon and is $39.95 on the product website. This one-month’s supply is more expensive than other similar products. Your discount will be $60 and $120 discount if you purchase 180- and 360-pack bottles on the website respectively. The manufacturer shows its confidence in this supplement by backing it with an extensive 500 day guarantee. BoostMood is likely to significantly improve the symptoms of mild to moderate anxiety thanks to its carefully curated ingredients. When it comes to the severest forms of angst, the amount of symptom alleviation will vary from person to person. The effects of the nervous system suppressant are cleverly countered by including a nootropic. Price-wise, this product costs more than most. We would have preferred the manufacturer to disclose the percentage of each ingredient included so as to better understand which sensitivities to the ingredients may occur. BoostMood garners above average reviews, but there is negative feedback. Some severe depression sufferers report feeling more anxiety and melancholy. This is probably due to their sensitivity DMAE Bitartrate.